Working in a surgical operating room (OR) requires discipline and strict attention to detail, even in civilian life—and it's no different for surgical service specialists in the Air Force, who hold Air Force Specialty Code (AFSC) 4N1X1. In the OR, though everyone brings a highly specialized skill set to the table, all personnel on the team must work together like a well-oiled machine. An integral part of that machine, the surgical service specialist (often referred to in hospitals simply as the "surgical technologist" or "scrub tech") presides over the sterile equipment table. He makes sure that dozens of pieces of equipment are carefully arranged and ready for the surgeon while maintaining their sterility, as well as the sterility of the operating field over the patient. And then of course the scrub tech has to keep strict count of every piece that's been used with multiple counts during and after the operation—because even though Air Force hospitals aren't subject to the same risk of lawsuits as civilian facilities, it's still obviously considered poor form to leave a rag or a caliper inside your patient. Urology: "Administers injections, catheterizes patients, performs laboratory tests and procedures, and administers intravesical medications." Orthopedics: "Applies and removes casts and splints . . . and applies orthopedic traction devices." The tech may also teach patients about "using crutches, canes, and other orthopedic appliances." Otorhinolaryngology (Ear/nose/throat): "Administers local anesthetics . . . diagnostic hearing and vestibular function tests. Makes ear mold impressions for hearing aids." According to the Enlisted Classification Manual, a high school diploma is a must to become an Air Force scrub tech, and while there are no other specific educational requirements prior to enlisting, a background in "general science, biology, chemistry, hygiene, and psychology is desirable." Of course, you'll also need to qualify for the job by hitting the right notes on the Armed Services Vocational Aptitude Battery (ASVAB). The classification manual is mute on the required scores, but ​ Rod Powers has figured out that applicants need a general aptitude score (combining arithmetic reasoning and verbal expression) of at least 44. After boot camp, job training for scrub techs takes place at the military's centralized health and medicine facility, the Medical Education and Training Campus (METC) at​ Fort Sam Houston, Texas. Their surgical technologist program trains not only Air Force scrub techs but those in the Army and Navy as well. The formalized training for scrub techs covers more than just the basics of sterile procedure—which is really just a basic way of doing things that every professional in the OR must be proficient in. ​The Subject matter also includes "basic surgical anatomy and physiology, vital signs, cardiopulmonary resuscitation . . . transporting and positioning patients," and other specialized information and skills. Unfortunately, the METC website doesn't include an exact time frame for completing the course, probably because in addition to classroom time the program includes clinical rotations that expose students to working in real surgical environments. The Air Force recruiting site ​​doesn't get specific about credits, but it does state that transferable credits may be earned at METC toward a degree in Surgical Services Technology. 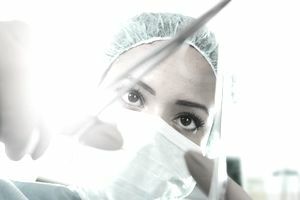 And here's a perk: Immediately after graduating from METC, Air Force scrub techs (and their classmates from the sister services) are eligible to take a shot at the exam for Certified Surgical Technologist, a credential that puts them ahead of their peers if and when they choose to leave the Air Force and seek a civilian position. That could be a pretty good position, too, whether you do your time and make the switch or choose to continue working after earning your military retirement. According to ​Career Planning Guide Dawn Rosenberg McKay, scrub tech is growing "much faster than the average for all occupations."